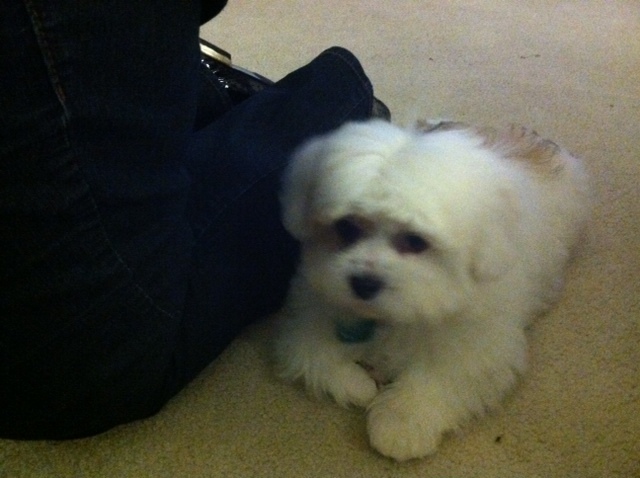 If you follow me on Twitter, then you know that we just got a new puppy! 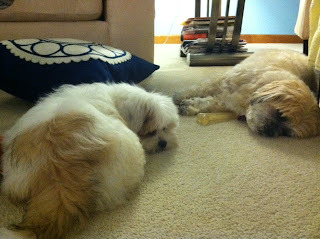 Ever since putting our Cody down at the end of January, we knew we wanted another dog (and not just for our sake, Molly, our other dog, missed her buddy). 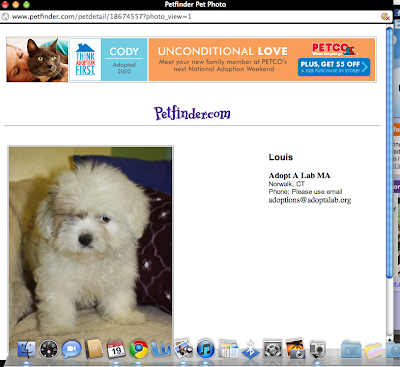 My mom starting looking around to adopt, and she found our pup on Petfinder.com. 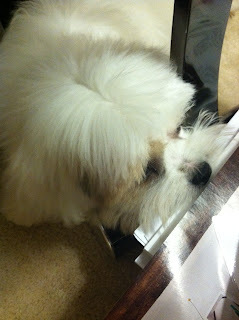 He is the same breed as Molly, Lhaso Apso, and is 3 months old. 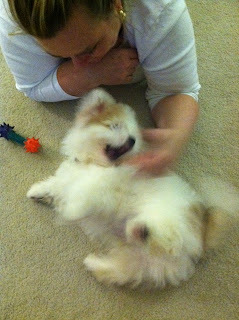 My mom and stepdad picked up Barkley on Saturday, and I finally met Barkley last night. I am just smitten! 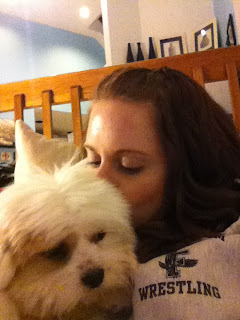 He is the tinest, fluffiest thing...he follows you wherever you go and then just plops and sits right behind you. He is playful and quite the little devil...chewing on magazines, computer cords, etc. He has the cutest freckles on his nose. Molly looks so big beside him now. She is not sold on him yet but is warming up to him. The first couple days, she ignored him, and now she allows him to get about 6 inches away from her (lol). 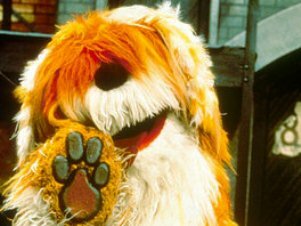 Barkley's original name was Louis, but when we got him, my family thought he looked just like Barkley the dog from Sesame Street. I saw that in the ad above his picture, there was a cat named Cody! I took it as a sign that Cody was giving us his blessing and this was our dog. so cute, he looks fake! like a muppet baby so his name is perfect. aweee! - i think Kayleigh wants another pup around - whenever Rusty (my boyfriends dog) stays over for a few days she LOVES it .. my Brother is getting another day - so atleast she'll have lots of play dates! OMG im dying from this cuteness!!! He's adorable! My Sister had a stuffed animal dog named Barkley when she was little. I forgot it was from Seasame Street. oh my! beyond cute, ADORABLE really! awww Barkley is soo cute!! i'm so glad your family has a new pup. i really think it WAS a sign that you saw a cat named Cody in the ad above his picture! he is so so so cute!! Good thing we dont live closer, I might have to come visit him and maybe never give him back he is so darn cute! Aww, freckles on his nose!!? So cute! I would take it as a sign too. Hope your family is as happy as they deserve to be! such a cute story, and a cute dog! Oh my sweetness. I love dogs and this guy is too cute. Congrats on the newest addition to your family. I am in love! 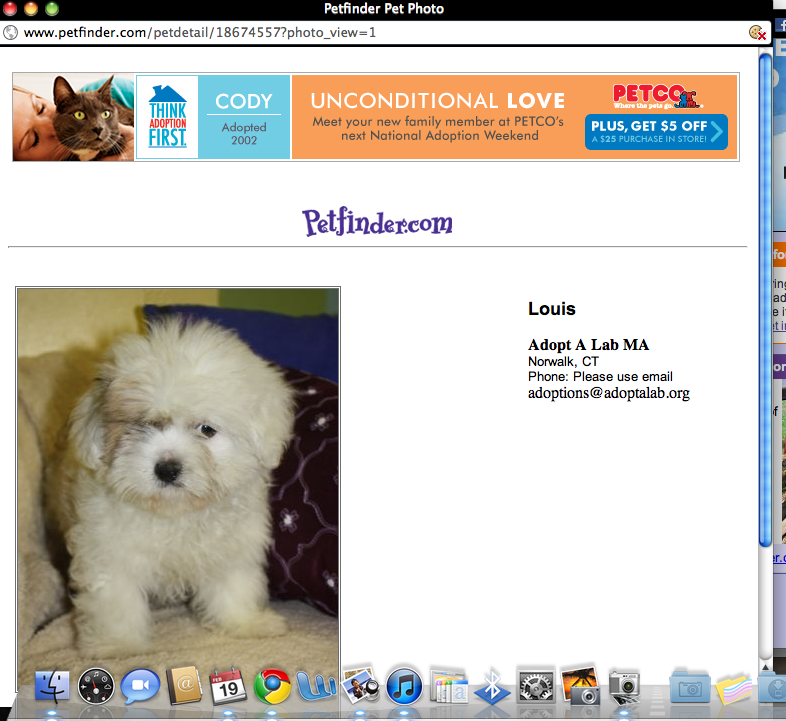 I confess, I scroll petfinder all the time when bored. I could never manage another dog but I just want them all. Even more addictive with Iphone app. 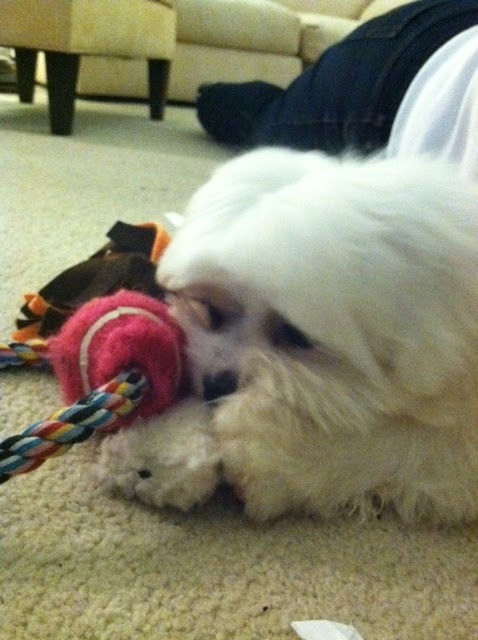 OMG what an adorable ball of white fluff! How could you not resist picking him with a picture like that?!?! LOVE! OH MY GOODNESS! Too cute! I am so happy for you and Barkley! The name is definitely fitting!!!! Barkley does look like Louis - what a cutie! Oh my gosh he is so cute!!! I was so excited to see your tweet yesterday with the news. Welcome to the family!! sooo cute! Congratulations on the new addition, so cute, so cute! I love that you got him from Petfinder.org, I love that more than anything. And I'm all about you finding Cody's name above his ad, I definitely would say the same thing as you! Cody knew "Louis" needed a home! Oh Jamie, Barkley is so doglicious. oh my goodness, he's a cutey!!! such a fur ball, i love him! He is just adorable, and I love the name. :) Congrats! So cute. Congrats on the new pup. Anyways side note, is that an FHS sweatshirt? Did u go there...I did, I graduated in 2000!